Is there a better alternative to macteens Chat? Is macteens Chat really the best app in Chat category? Will macteens Chat work good on macOS 10.13.4? 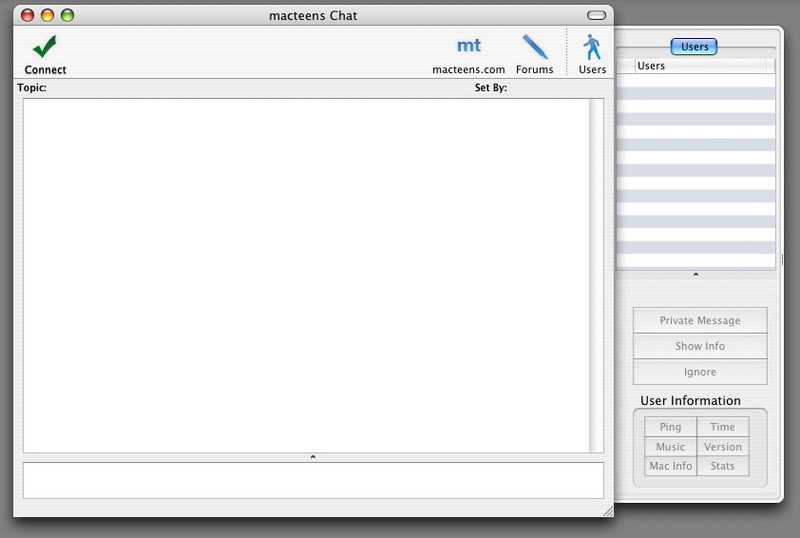 Harnessing the power of open source, and incorporating the ease of use of your Mac is what mt Chat is all about (well, it's about chatting too). Our latest creation will allow you to easily connect to the vast number of mac teens chatting at any one time, by clicking just one button. Call us crazy, but we think that's pretty nifty. Mac OS X 10.3 or later recommended, limited support for Mac OS X 10.2.
macteens Chat needs a rating. Be the first to rate this app and get the discussion started! Based on a popular open source application called OpenMac, mt Chat is a truly innovative and easy to use next generation chat application. Our current IRC users won't be left in the dust either. At its heart, mt Chat is an IRC app that connects to the incredible GameSurge IRC Network; meaning there's already real people in the chat! Power users will be impressed with the advanced preferences and CTCP (user information) functions available. You can check anything from one's Mac to the music that they are listening in iTunes. You can customize just about every aspect: we should have named it "Your Chat!" mt Chat also has an auto update feature: so you're never left in the dust when there's a new version of mt Chat!